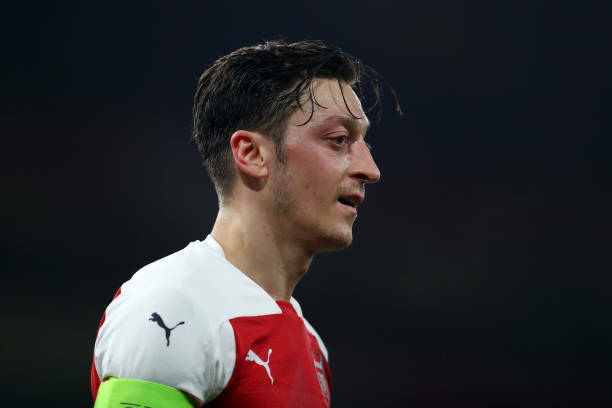 Mesut Ozil has been at Arsenal for five years now and he has helped the gunners win three FA Cups but the German international is rumoured to leave the North Londoners at the end of this season because Unai Emery doesn’t value him so much. Mesut Ozil was not included in the Arsenal squads that faced Huddersfield Town and BATE Borisov away from home but he has finally been brought back to the match day squads because Unai Emery has maybe been impressed with his performances in training. Ozil was in the lineup that faced Bournemouth and the midfielder scored one goal and made one assist as the gunners beat Bournemouth 5-1. Mesut Ozil is a fan favourite at the Emirates Stadium because he joined them at a time when the club had stopped attracting top players and he has been impressive in the years he has been at the North London club. The Arsenal fans absolutely love him and one of them who was at the game on Wednesday recorded him when he came to take a corner and he applauded the crowd, and as well as tapping the Arsenal badge to show that he’s a proud Gunner. It remains to be seen whether Mesut Ozil will be able to impress Unai Emery in the last months of the season because most reports claim that he will be added on the transfer list because the North Londoners want him off their wage bill which is high because of his massive wages.